When I first entered Piazza del Popolo, the beauty of the surrounding buildings took my breath away. This large square in the heart of Ascoli Piceno (see map) paved with gleaming travertine and flanked by Renaissance porticoes, is the setting for the city's finest buildings - the Palazzo dei Capitani, the Church of San Francesco and a line of lovely colonnaded stores (the Loggia dei Mercanti). Piazza del Popolo- The People’s Square - is the place where everyone gathers to meet, to watch, eat, shop and take their evening stroll, the passeggiata. There are many restaurants here serving local cuisine at reasonable prices. Another wonderful thing about this piazza and nearby Piazza Arringo, is that they are traffic free zones so you don’t have to worry about a car or a scooter startling you as you stroll around. This gives the town a very special ambience of tranquility and serenity and makes it magical by both day and night. Surrounding the town are the Sibillini hills and only thirty minutes away is the beach at San Benedetto del Tronto, making it a perfect location, well serviced by public transport. It is a thriving town with a well-preserved historic centre. Its pretty side streets are like warrens, inviting you to explore them. Everyone we met was really friendly. For example, when we entered Palazzo dei Capitani, the woman at the desk offered to give us a guided tour. The façade of this building has a sculpted portal with a monument to Pope Paul III and a beautiful large stone clock. Inside she showed us the pretty three-tiered Renaissance courtyard surrounded by arcades, the seat of council on the first floor and an underground archeological route with Roman ruins below. Our friend Stefano suggested that we have a caffe corretto all’anisetta in the adjacent building, the famous Caffè Anisetta Meletti. Anisetta is a sweet, delicious aniseed-flavoured liqueur. It gave us a warm feeling as we sat beneath the frescoed porticoes with elegant arches and watched the action in the square. The service was very attentive, but not intrusive. This Café has been featured in many films, commercials and photo shoots. ‘Alfredo, Alfredo’ (1972) starring Dustin Hoffman. Next we went to the Church of San Francesco at the top of the square. It has three gothic portals sculpted from travertine and two bell-towers. Inside, the stained-glass windows have different stories to tell as they filter light throughout the interior. In the left nave is a crucifix that miraculously survived a fire and is reported to have spilled blood twice. Last but not least, the Café Lorenz to the left of the church sells takeaway stuffed olives, a speciality of the region called “Olive all’Ascolana”. I usually find green olives quite bitter but was encouraged to try these and discovered they were surprisingly delicious! They are large green Picene olives, stuffed with mixed meats, usually pork and veal, breaded, deep fried and served hot. 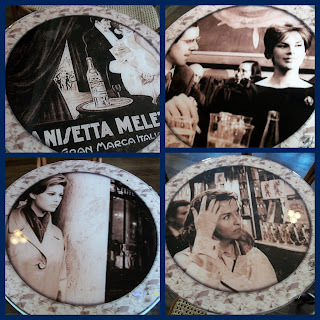 You can also find these in Piazza Arringo at a vendor named Migliori. ﻿In the opening scene from the film 'I Delfini' there is a marvellous panorama of Ascoli Piceno followed by atmospheric shots of Piazza del Popolo and the exterior of Caffe Anisetta Meletti. I hope that between this and my previous post, I’ve given you enough reasons to take a day trip to amazing Ascoli Piceno. Yes, dearest Nora, you've given very pretty reasons to rush immediately to Ascoli Piceno! Thank you Tatiana. Ascoli Piceno is a place that I will be returning to! I love those olives and your photo reminded me of the day we bought them at a stand in Ascoli Piceno and savored every single bite! I even saved that little paper holder. Hi Janie, I saved the paper holder too! Happy to hear this brought back a nice memory of your time in Ascoli Piceno. Thanks for your comment!